Up here in the northeast it’s cold, dark, and time for ICE CREAM! I know it sounds a bit strange to want ice cream when it’s so cold outside, but when ice cream calls, I must answer. I was left with loads of egg yolks after several tests of macarons. What to do with all the yolks? That’s easy, ICE CREAM! Once again, The Perfect Scoop came to rescue. While I’m not usually a big cookbook person, there’s always something nice about having a good recipe that just works. This time I didn’t use just one recipe, I used THREE! 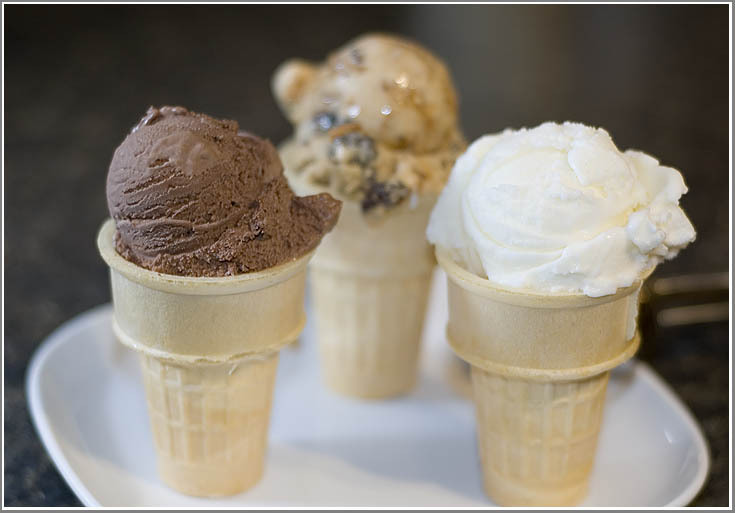 I chose three full-fat, full sugar ice creams: Chocolate, Oatmeal Cookie, and Fleur de Lait. There was no rhyme nor reason, I just chose three that sparked my interest. Chocolate because it’s my favorite, Oatmeal Cookie because I really dig the cookies, and Fleur de Lait because I just wanted to see how it would come out. As usual, all the recipes were spot-on, easy to prepare, and worked. If you can make cream anglaise, you’re most of the way there to making ice cream. Many of the recipes in David’s book are based on this sauce so if you were able to make one of the French-style ice creams, you can pretty much make them all. The only difference in many of the recipes is the addition of certain ingredients or mix-ins. I did choose an unusual egg yolk-free ice cream, Fleur de Lait. I was a bit intrigued by an ice cream that was thickened with corn starch and not flavored with anything other than sugar and milk. Since there is corn starch in the ice cream, it still has to be cooked so the cornstarch can work its magic thickening the mixture. When fully mixed and frozen, it comes out of the machine very white. The taste is very smooth, like frozen milk, but not icy at all. The best part about this flavor is you can mix anything into it or onto it and the flavor is not at all lost. It’s a lot like vanilla, minus the vanilla. The only problem with making all this ice cream is now I have to eat it! I’ll be more than happy to help you out with the eating 😀 They all look fantastic. I have (and love) the book and now, i can’t wait to try Fleur de Lait.